Work on cataloguing the collection of the Union Pension Services Limited (UPS) has recently been completed (LMA/4589). UPS is a consultancy and information service on state and occupational pension schemes for Trade Unions, established in 1989 by its director, Bryn Davies. The majority of the collection consists of explanatory booklets and other information sources produced by pension schemes for their members, which were used by UPS to produce Pension Scheme Profiles, their survey of pension benefits offered by UK pension schemes. Pension Scheme Profiles offered scheme members and trade unionists the opportunity to compare the benefits offered by major occupational pension schemes, assisted by UPS’s scheme rating system. The booklets provide details of the benefits offered by over 600 company and industry pension schemes, and show the information schemes provided to their members and how this information was communicated to members. 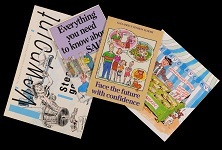 UPS produced four editions of Pensions Scheme Profiles between 1993 and 2003, which means the collection includes successive editions of pension scheme booklets for a number of schemes and could therefore be used to show how pension provision has changed over time. Copies of two editions of Pension Scheme Profiles are included in the Pensions Archive’s library collection. UPS also offer advisory services to trade unions and produce other publications on pension matters, some of which are included in the collection.